Place a pan on the stove,and add oil to it. When the oil is heated add the seasoning materials. After they crackle saute it and remove from fire. Place grated coconut ,roasted bengal gram daal, and only red and green chillies from seasoning,in a small grinder,along with tamarind and salt. 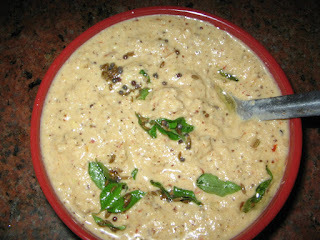 Grind it in to a paste,after it is done ,add the jeera ,mustard seeds from seasoning. If u are not interested in tamarind,do not use it. Lastly after mixing the seasoning,add curds or lime juice in the chutney. Very tasty and ideal with idli,dosa and all tiffins. This chutney i prepare in my kitchen and store in fridge upto 2 or 3 days before mixing curds or lime juice .